WED 9:30-11am Intermediate Course, 11am – 12:30 Adult Improvers. NEW Beginner/Returner courses – Email adstennis@hotmail.co.uk for details. Adam has 20 years’ teaching experience and is LTA and PTR qualified, as well as being fully licensed and CRB checked. During his career, he has taught a wide range of players from absolute beginners to international players. He has personally coached players who have gone on to play number 1 for GB in Davis Cup as well as 4 juniors who have gained their GB colours, one of whom has played at the junior Wimbledon event. As a player, Adam maintains a 4.2 rating and competes for Kent in County Cup. 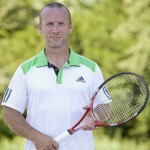 He has been the winner of 2 British doubles titles in over 35’s tennis and has been ranked as high as 4 in the country and 66 in the world in singles. Adam is married to Louise and has 2 daughters, Darcey and Amelie. The ADS Tennis School offers coaching opportunities for all ages and abilities and aims to provide a variety of coaching for everyone to improve and enjoy their tennis, whether a beginner or a top club player. The programme includes weekly courses, drills sessions and individual or group lessons. If you are unsure which session would be right for you or your child, please contact Adam. All cheques for coaching are payable to Adam Swan. Full details on the junior coaching programme is available on the Juniors coaching page. A great course to fine tune your basic technical and tactical knowledge. Added to this will be plenty of situation tennis to gain point experience. A more intense coaching lesson looking at every aspect of the game. This course is geared towards experienced or team players looking for structured technical and tactical help. A relaxed and confidence boosting drills session. Slightly ‘toned down’ pace and aimed at low team standard players or people coming back into the game after a lay off. This is a free session open to members looking to get some video analysis, advice and practice. All standards welcome. An intense and high cardio session aimed at team players. Basket drills and situation tennis, finished with point play. These Drill Sessions are available to Intermediate/Advance team level looking for a fun and energetic start to the weekend. Basket drills and point play for all. WITH ADAM (07795 595294) 1 or 2 people £30 per hour. 3 or 4 people £40 per hour (add extra £2 pp non-member of Club). WITH JONNO (07554 226939) 1 person £25 per hour. 3-4 people £30 per hour (add extra £2 pp non-member of Club). 24 hour cancellation policy or lesson is charged in full. Home visits are available, please contact Adam for rates. Tennis is an outdoor activity, and therefore affected by the weather. Cirencester TC members’ safety is paramount, and during times of heavy rain, thunderstorms, snow and ice, coaching sessions will have to be cancelled. On these occasions, the coach for the session will make the best possible decision in the interest of both players and parents and this decision will be made when possible on site. If you have any doubts regarding your tennis session then please call Adam on 07795595294. Courses will be run over a given number of weeks with 2 ‘spare weeks’ to cope with missed sessions. Regretfully refunds cannot be given when the full course cannot be completed due to weather conditions out of our control.